In The Creative Destruction of Medicine, geneticist and cardiologist Eric Topol introduces a radical new approach to medicine. By bringing the era of big data and personal technology to the clinic, laboratory, and hospital, doctors can see a full, continuously updated picture of each patient and treat each individually. Edward Larkin believes that although Topol’s vision may be somewhat premature, the book is a must-read for anyone interested in the relationship between technology of medicine. 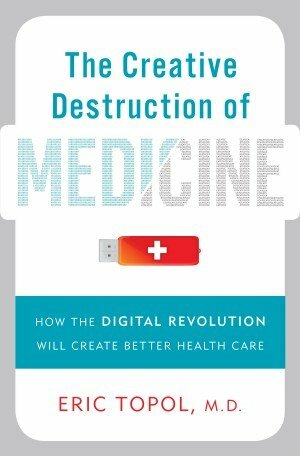 The Creative Destruction of Medicine: How the Digital Revolution Will Create Better Health Care. Eric Topol. Basic Books. April 2012. Every once in a great while, amidst the doomsday predictions about the percentage of GDP that will be eaten up by health care in 2050, the drumbeat of reports about the astonishing amount of money spent on “waste” and “unnecessary care”, and the horror stories about inequalities, waiting lists and the privations of insurance companies, someone dares to strike an optimistic note about the future of health care. Eric Topol, a prominent cardiologist at Scripps Research Institute in San Diego, is one of these rare optimists, and his recent book, The Creative Destruction of Medicine: How the Digital Revolution Will Create Better Health Care, is an exhilarating account of the coming intersection of technology and medicine. The digital tools that will usher in these changes – sensors to detect calories burned, steps walked, sleep cycles, blood pressure, and blood glucose – are either already available or will soon be soon. AliveCor sells an iPhone case that doubles as a mobile electrocardiogram, and researchers at the University of Illinois recently developed a flexible electronic skin tattoo that can pick up physiological metrics. These are all serious innovations, but to label any as ready to meaningfully improve health would be sensationalist. However, any preliminary study of history of computation over the past fifty years teaches us that it’s highly unwise to ever bet against it. Where data and computation can encroach, they do. The more salient question is whether the human body can be “digitized,” as Topol puts it, in the first place. Thirteen years ago, on the eve of the completion of the human genome project, people spoke breathlessly of an age in which disease risk was known and thus quantifiable and preventable. All one had to do was read the genetic code, and an individual’s future medical history would be laid out like a deciphered hieroglyphic. This hope has diminished considerably over the past decade, as researchers learned swiftly that there’s no such thing as the “fat gene” or the “height gene,” and that even seemingly straightforward diseases have mind-numbingly cacophonous genetic profiles. The environment is much more important than we imagined, and figuring out how to understand the effect it has on genes is just beginning to be understood. There’s certainly a chance for breakthroughs in the near future, but the genome looks a lot less like the Rosetta Stone than it once did. To his credit, Topol is is quick to point out that the gains of genetics haven’t materialized fully, although for some reason, his general optimism remains undiminished. Despite the impressive amount of technical detail contained in the book, one need not have a sophisticated understanding of either biology or medicine to grasp the magnitude of some of Topol’s suggestions. For example, he discusses the potential for nanosensors in the bloodstream to detect a heart attack before it happens, based on a high concentration of cells that have been sloughed from artery walls, alerting the patient of an impending event via smartphone. Eventually, Topol says, the sensors might even be able to squirt out drugs on demand, completely closing the loop. He also predicts that cancer will be much more effectively dealt with, as the “tumor genome” is repeatedly sequenced to identify important mutations, and tailored chemotherapy delivered. If and when these innovations come to pass, they will be game changers. Topol is convinced that consumers, not physicians, will lead the charge towards digitized medicine. For the most part, he is right. Organized medicine’s clumsy attempted blockade of personal genetics companies indicates a profession that clearly isn’t ready to lead. As medicine becomes more standardized, rule-based, and predictive, the demand for highly paid doctors will diminish. Recent walk-in clinics that are staffed by nurses and run at a fraction of the cost are proof of this. But this legitimate conviction morphs into a latent hostility towards organized medicine that is, at best, distracting. Topol calls medicine “sclerotic, even ossified,” an illegitimate “priesthood,” a “cocoon,” and accuses it of being the profession most resistant to change on the planet. Granted, Topol presumably isn’t interested in winning over doctors, but his consistent vitriol sometimes takes away from the point at hand. The major question for Topol’s argument is whether people really care about their health. Not care in the banal sense – everyone is notionally interested in remaining alive and healthy. Care in the sacrificial sense – are people actually willing to put effort into maintaining health, enough to buy the sensors he talks about or make the lifestyle changes necessary after receiving their genetic information? The answer here is certainly less than a resounding yes. Most of us eat far more poorly even though we know exactly what a healthy diet would look like. Many of us work out far less often than we should, even though we have enough time to do so. Maintaining health simply isn’t fun, especially because the effect is so diffuse and vague. The marginal calorie I eat right now tastes great right now – the benefit accrues immediately. Presumably, it negatively affects my health. But when? In 6 months? A year? 20 years? The marginal cost is almost completely invisible. Indeed, a study by Topol himself and his colleagues themselves found that, while individuals actually do prove to be resilient in terms of reacting to bad news from genetic tests, they don’t change their behaviour much at all even to prevent health problems. Thus, access to genetic information alone probably won’t change many people’s behaviour. This certainly mirrors my own experience. I paid for a genetic test from the company 23andMe last summer. While the results were informative, even high risks for certain diseases didn’t motivate me to do any research on what I could do to avoid them, much less make the difficult lifestyle changes necessary. And this is coming from a medical student who is interested in this stuff. In 2015 and perhaps even 2020, health care will probably still resemble what we experience today rather than Topol’s digital utopia. Perhaps some of Topol’s suggestions are premature. But this is precisely the issue – prematurity. These things will happen, at some point. It’s just a matter of when. Which is a crucial question, because if anything is going to save the day, it is going to be technology. Until technology finally steps in to save us from ourselves, the sheer momentum of normality and a daily routine prevents most of us from changing our behaviour much. Basically anything that takes any sustained, unpleasant effort with uncertain rewards will not be done. But I would put my money on the fact that come 2040, Topol’s vision will prove much more durable than any of the other shrill predictions that are out there.